There are Seven Skills that give a cat great power, and Varjak Paw knows them all. He can fight, he can hunt, he can walk unseen. There's just one problem. Thank you so much, Tyrar - and thanks for taking the time to leave me a comment! Hello, I have been reading your books for 2 Years and I have to say that they were fantastic, the names of every Character and the detailed storyline has got me glued to the book, but for one question, where did you get the name Varjak from? Because umm a long time ago I once had a Human Warrior Character named Varjak and I was surprised that the name was used, I am not mad about this because I know alot of people have also used the name too. Hello, you came to my school, Park Hill Kenilworth and I bought the Outlaw Varjak Paw. It was great and I couldn't stop reding it so it was finished a one am on Saturday morining! You'r books are the exact books that I love! thank you. Hello Rose, and thank you so much for that brilliant comment! I love it when I find a book that I can't stop reading, so it's fantastic to hear that you felt like that about The Outlaw Varjak Paw! I hope you'll enjoy my other books too! Hello again! I'm going to be SO exited when you're knew book comes out! Belive me, I will be the first in the shop to buy it! If you write a third book of Varjak Paw, would Sally Bones come back to life and become a good guy or become a spirit and restart the vanishings? Hello again Rose! Thank you so much! I will write a third Varjak book one day, but not for a while yet - I wrote a bit about my idea for it here. In the meantime, if you haven't already read it, I hope you'll try my new book Phoenix - it's not about Varjak, but I think if you enjoyed Outlaw, you'll enjoy it too! Thank you, that really means a lot to me! Happy reading! Hello, My name is Isabella. My friend and I have just finished your books! I am addicted to them! What happened to Holly’s eye? Do you have any other similar books? If not any recommendations? I cant wait to see the third book! Hello Isabella! Thank you so much for your lovely comment, and please thank your friend for me too! I can't say too much about Holly's eye at the moment, but I think the third book will answer your questions! It might be a while before I write that book though, for reasons I wrote a little bit about here. In the meantime, have you seen my new book Phoenix? It just came out a few months ago. It might sound quite different on the surface - humans & aliens rather than cats & dogs - but if you like Varjak Paw, I hope you will enjoy it too; many of the same themes and ideas are at the heart of it. I love the books. They are awesome! I have some questions, what is going to happen in the next book after the outlaw varjak paw? And who is going to be the antagonist in the next book? I can't tell you yet exactly what is going to happen in the third Varjak Paw book, as I haven't started to write it yet. But you can find out most of what I know in this blog post, where I talked about my ideas for the book. In the meantime, I hope you'll try my new book Phoenix. It's not a Varjak Paw story; not even cats and dogs this time, but humans and aliens instead. Nevertheless, if you like Varjak, I think you'll find lots of things to like in Phoenix, too – it has very similar themes underneath the surface. Thank you so much! I'm really glad you enjoyed The Outlaw Varjak Paw, and I hope you enjoy Phoenix too – I think it's the best book I've written so far! Thanks for the question! I wish it didn't take so long. But my aim is to make each one of my books as good as it can possibly be, however long it takes. In the case of Phoenix, that took seven years. It's a really big, epic story, set across a whole galaxy, and it's about three times the length of Varjak Paw – so maybe it's not surprising it took so long! And it is as good as I could make it, so it does feel worth all the time and hard work now. Having said that, I hope my next book, TYGER, will not take as long as that! I've read your first and second book and I really liked them but I want to ask you a question. Varjaks eyes in the two books are all yellow but the side of the book has black pupils in the middle do you know what that means? Hi Malachi, thanks for your comment. I didn't do the pictures, so you'd have to ask Dave McKean about this if you want to be sure - but I think they just show different angles. You know sometimes when you look at a cat's eyes, they seem to be entirely glowing? And at other times, you can see the pupils? For me, that's what the pictures suggest. I hope that's helpful! Thank you so much for your lovely message! It really means a lot to hear that my books are your favourites, and that they've inspired you to write as well. I'd be very happy for you to write as many stories as you like based on Varjak Paw – some of the first stories I wrote were based on my favourites too! – though my agent says I can't give you permission to sell those stories, or make money from them in any way. As for tips on writing, I'm doing a series of them right here on my blog; just click this link, and scroll down to the bottom to find them all. Hello again Isobel! And thank you – I would love to visit your school, so please do ask your headmaster to get in touch with me by leaving a comment here with his email address, so that I can reply to him. Many thanks for giving me the email address. I will send Mr Kemp an email now. Yes, I emailed the school just after you sent me the email address. I haven't heard anything back from them, though. Perhaps you could ask them if they received the email? If not, I can always send them another one. In the meantime, thank you so much for reading Phoenix and for sharing it with your best friend! I'm so glad you both liked it! Who was your favourite character? My favourite character is bazooka and my best friends is bixa with her needles in her hair and lightning fast fighting moves. My favorite bit in the story was when lucky/lucifer turned into a star and created space again. My second favourite bit in the story is when luck found out his mum was a shadow guard. I will ask the headmaster about the email problem. p.s I am writing a story at the moment. I love what you say about Phoenix – thank you so much! Those are some of my favourite things in it, too. Just to let you know, I've now heard back from the school. Unfortunately, they don't want to make a booking for me to visit. But if you like, I can send you signed book plates that you can stick into your books? At least that way, you'll have them signed. Let me know if you'd like this, and I'll send them to you care of the school. Good luck with your story, and with all your writing! Thank you so much for your amazing comment! There is a second book about Varjak Paw; it's called The Outlaw Varjak Paw. You can read about it on this page. There will be a third book about him one day, but not for a while yet. I wrote a bit about it here. In the meantime, I hope you'll try my new book Phoenix - it's not about Varjak, but I think you might enjoy it too! From Tyresse, 10, year 6, onyx class. Hello Tyresse! Thank you so much for your amazing comment - it really means a lot to hear things like that about my books. The Outlaw Varjak Paw wasn't an easy book to write, a lot of work went into it, but hearing that makes all the hard work feel worthwhile. Thanks again - and please say hello to Mr Hall from me! Tell me how you came up with the name Varjak? I named the character of Varjak after my own cat, whose name was Varjak Paw! Did you know that the name means varjak raven in the Hungarian language. I didn't know that, but I'm very interested to learn it – thank you very much for letting me know! I've heard that 'Varjak' means 'warrior' in Polish, too. On your other question, Monamy was the name of the cat I had when I was a child, but Varjak was the name of the cat I had at the time when I started to write Varjak Paw, as an adult. I mean, does that mean that you name Varjak? Monami means - my friend. Varjhak also what it means? I didn't know it had a meaning at that stage – it was just a name that I liked. It came from a mis-hearing of a line in the film 'Breakfast At Tiffany's', which has a character called Paul Varjak. Another character reads his name as "Varjak, Paul". I mis-heard this as "Varjak Paw" and immediately thought it would be a great name for a cat! Now sure how I didn't find this website before. But I wanted to say thank you for writing such brilliant books. It has been a few years since I read them, but I still remember them today :). Do you have any plans of expanding on the series? I would love to see a prequel about Jelal, my memory is bad but I think I got the idea that Sally Bone was once his enemy as she had survived for a very long time before finally loosing to Varlak, I would love to read about their struggle. Oh and I am sure you get this a lot, but I read on the wiki that the movie rights were bought. Is there any word on this? Or is there no progress currently :P? But anyhow thank you for your brilliant work. I may have to check out your other series some time too :). Thank you so much for your visit, and your kind words about my work! I will write a third book about Varjak one day, and I think it will include some material about Jalal's early days, so I hope one day you'll read that book! It won't be for a while, though – I wrote a little about it here. On the question of movie rights, the latest info is all here. And as for my other work - my new book Phoenix is now available in paperback. It's about humans and aliens rather than cats and dogs, but I think if you enjoyed Varjak, you'll enjoy it too, as it very much comes from the same place. And you may be interested to learn that the next book, which I'm currently working on, is called TYGER! Why she had one eye? Thanks for your question. Sally Bones wasn't in the first draft of Varjak Paw. Originally, the bosses of both gangs were big strong tomcats, like Ginger. I noticed this and thought it would be better to make them different, and more interesting to give them different qualities. So Sally Bones gradually evolved as I worked on the book, and became much more interesting, I think! Yes, the book became so really the best! Sally Bones is a very interesting character. Varjak among fans in Russia, Sally Bones second most popular after Varjak! Tell me please: How did you create this character? What helped you to create Sally Bones? That's great to hear, thank you. It was really just a process of trying things out. First I thought it would be more interesting if she was intelligent, rather than physically strong, and became a leader because of her intelligence. Then I thought it would be even more interesting if she knew the Way as well – maybe even knew it better than Varjak! Once I had that idea, I thought she had become a really interesting character. I'm glad that fans like her too! It's really colorful character, you'll have a very interesting comparison: Sally Bones seemed represents darkness, cold and winter. A Varyak sun and hope. When Varyak wins the dawn comes and with it the spring. It would be great if in the third part of the story you told Sally or fight Selii and Jalal! You get a wonderful character! Thanks again! I think something like that is likely to happen in the third book... one day! All the characters and two books are amazing, they serve as something like comfort and adventure for me to hide myself away in <3 News about a third book someday is exciting! Do you think a new villam will arise, or would it be something entirely different/internal within the cities? Or do you think it would play about Varjak's past family? Personally, I wouldn't be anxious for a movie on this series - since directors have "visions" of how it'll be from their perspective, rather than the author's (and pretty much making them kind of suffer throughout the filming if things aren't agreed on), if that makes sense? Thank you so much for all your thoughts and questions! I don't know much more about the third book at this stage than the various things I've said around this blog, so we'll see when the time comes... But I'm so glad you've enjoyed the first two books, though! It would be great if you make a post about the characters in his books, such as Varjak, Razor, Sally Bones, Holly, Kludge etc.. It would be interesting to know how you came up with them, they were prototypes, that inspires you to create the characters. Thank you for your comment. I've never done a post like that, and to be honest, I wouldn't know how to. The process of character creation is a bit mysterious, even to me, so perhaps it's best to just let the characters be themselves, and enjoy them as they appear in the books! I would like to know if there will be a return of.. well he's not quite gentle..
Because unless Cludge gave him rabies, he should still be out there, right? Thank you for your message - that's a very interesting question. I honestly don't know what the answer is at this point, as I haven't started writing the third one yet, but I would say that anything is possible! I read Varjak paw when I was younger, I couldn't put it down, it's my favourite book ever! 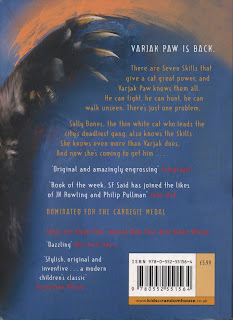 I'm 15 now and I've read many books and still not one book has been as brilliant as Varjak Paw! I have just discovered the second book and I'm super excited to start reading it! Thanks so much for writing such entertaining books! Thank you so much for that amazing comment – you've just made my day! I hope you enjoy The Outlaw Varjak Paw as well, please let me know how it goes! We are Year 3 from St Francis School in North Somerset. We adore your fantastic Varjak books and think you are the most amazing author! Your books are our favourite books ever... by miles!!! We would love to find out what happened to Varjak and the Free Cats. Do you think you might ever write a new Varjak book? We hope so! We would love to know what happened to Holly's eye? Also is Sally Bones really Jalal's enemy Saliya of the North? What is your favourite book Mr Said? Thank you so much for your fantastic comment - that really means a lot to me! I will definitely write a third book about Varjak one day, but it won't be for a while yet. I wrote a little bit about my idea for it here. I hope you will find answers to your questions in it, when it eventually happens! As for my own favourite book - I think it's probably Watership Down by Richard Adams. I wrote a bit about it here. The BBC are about to do a new animated version of it, so this would be a great time to read it! SF said I loved your first book. In fact when i heared the next chapter I jumped I up and down whith excitment. Thank you for your comment, it's great for an author to hear from readers! Thank you so much, that's amazing to hear! I hope you enjoy the rest of the book too! hi Sf said I am the biggest fan of yours and I just wanted to say that my teacher is begging you to write the 3rd book of Varjak paw I have a brilliant idea for your next Varjak Paw. my idea is that sally bones is back and bad she has a neice...Sally slicer and she doesn't want to become like her aunt sally and varjak and holly get kittens ill tell you the next bit tomorrow Do you like it already? Thank you so much for your kind comments! I will definitely write a third Varjak Paw book one day, but it might not be for a while yet. I wrote a bit about why, and about my ideas for it, in this blog post. But I'm always very honoured when people write stories using my characters and worlds. Some of the first stories I ever wrote used characters from my favourite TV shows, so I think if you want to read the story you're describing, you should write it yourself! Happy writing - and happy reading! Thank you again! Don't worry, I will write a third book about Varjak one day – I wrote a bit about it here. Hi SF, just wanted to let you know that "The Outlaw Varjak Paw" is now available as an ebook in the US at both Amazon and Barnes & Noble! At last! Just bought my copy today! Hi Steve, thank you so much for that wonderful news! And thanks for making me aware of the situation; I'm glad it's finally available. Happy reading – and best wishes! Hi SF said my class has been reading this my teacher likes it i love your books, you inspired me. Thank you so much again, Natalie! Reading books is definitely as vital to me as eating, sleeping and breathing... So yes: keep the Way alive! Thank you so much for your fantastic comment! I'm so glad that you feel inspired by my books. Keep reading! I write to you from the States. We absolutely adored the audio version of Varjak Paw. How can we purchase an audio copy of The Outlaw Varjak Paw? It doesn't seem to be available on this side of the Atlantic. Thank you very much for your kind comment! I've passed your question on to my agent, and will get back to you when she has some information. Thank you! I look forward to hearing her response. "There is no physical audio version of Outlaw at the moment, in the UK or US. However, there is a downloadable version (unabridged), and it looks like is available from audible and amazon.com, so should be purchasable in the US." I hope that's helpful - please let me know how you get on. Thank you for checking with your publisher. I am an Audible member, but The Outlaw Varjak Paw audio is not available in the US "version" of Audible or Amazon. I wonder if it's possible for your publisher to contact the US "branch" of Audible and ask that the book be added? I have red the first book and im reding the second for the second time. Its by far my favourite book. Its AMAZING. i cant put it down! Thank you so much for your amazing comment! That really means a lot to me. Who is your favourite character in the books? Thanks for coming back to me on this - I've passed your comment on to them, and will get back to you with the reply when I have it! when my teacher said we had to a mythical story I wrote the story and my friend had to peer asses it and she loved it so much that she wanted a part 2 so it took me a while and i wrote it finally when she read it she wanted a part 3!!!!! but what i hadn't realised.was that she was enjoying it so this is your lesson it's not about how long the story/varjack paw 3rd takes it about how people think of your book do they enjoy it? me personally i love all your books . Hello Mr Said i just wanted to say that how do you get ideas.Could you give me some tips on how you engage with young readers and how do you make them get interested in your books?????????????????? I hope it works for you - please let me know how it goes! Thank you so much for your amazing comments! I'm really glad that you enjoy my books, and are now reading all sorts of other books, and writing your own stories too! That's a very inspiring thing for a writer to hear, so thank you. I'm afraid I can't give you a date for the 3rd Varjak Paw book, because I haven't written it yet. I wrote a bit about why, and my idea for it, in this blog post. But I will definitely post about it when the time comes. Hi there, and thank you for your comment. I think you can get ideas from anywhere. The idea for Varjak Paw started with me looking at my own cat – I wrote a bit about it in this blog post. As for making readers interested in my books – I do everything I can to make my books as exciting and page-turning as possible. And I also try to fill them with everything that I love and find interesting myself. So my best writing advice would be to write the stories that you most want to read yourself. I've done a few other writing tips on this blog; you can find them here. Hi Mr. Said. I'm Mia, from the U.S.A. I recently finished your Varjak Paw books and I loved them. I loved the illustrations and the characters from the book. The characters were very believable and I drew fanart of Varjak Paw. I really hope you make a Varjak Paw Movie. I would watch it as soon as it came out. I imagine it to be similar to the German film Felidae, but more kid friendly. Basically what I'm saying is that you should keep making books. I'm also glad that you haven't made too many Varjak Paw books because many great series have hundreds of books and it just gets repetitive sometimes. Thank you so much for creating these books (I will read Phoenix soon). Thank you so much for your wonderful comment! I'm so glad that you enjoyed the Varjak Paw books. There will be a third book one day, but not for a while, and I think there will only be three. I wrote a bit about my idea for it here. I also wrote a bit about plans to make a Varjak Paw movie here. Phoenix will be published in the US next year by Candlewick Press, but is currently available in the UK. I think it's the best book I've written so far, so I hope you enjoy it too – please let me know what you think if you get a chance to read it! Thank you very much! There's lots of information about Phoenix on this page of my site. I hope you enjoy reading it - please let me know what you think if you do! Salutations! And thank you for leaving me a comment that has brightened my day! The latest update from my publishers is that the link should now be working fine. I hope it does work this time - please let me know what the latest is! Me and my class have just started reading the outlaw varjak paw and so far it sounds amazing!!!! I am so excited to read on and can't wait to find out what happens to the family, Sally Bones and Razor. Thank you so much for letting me know! I'm excited to hear that you are enjoying The Outlaw Varjak Paw. Quite a lot happens to Razor in particular as the book goes on... Please let me know what you think when you get to the end! Thank you so much for your kind comments! I'm really glad you enjoyed The Outlaw Varjak Paw. There will be a third book about Varjak one day; I wrote a bit about my idea for it here. In the meantime, have you read my new book Phoenix yet? It's not about cats, but if you enjoyed Varjak's adventures, I hope you will enjoy it too! Hi again Estevan! Thank you so much - I'm very lucky to work with a brilliant illustrator like Dave McKean; I think his pictures really help bring the books to life. I hope you enjoy Phoenix too - please let me know what you think if you get a chance to read it! Can u tell me a little about your self? Hey there! I just want to say how much the Varjak Paw series has impacted my life, so much inspiration has been given to me by these books. I cannot express how much I love them, the second in particular. Razor and Sally have to be my favorites, and I have a question about Sally's eye. For the Outlaw Paw's Russian back cover, Sally's eye is on the left side, is that the official side it's on or is it supposed to be flipped to the other way? Hey S.F I realy like Varjak Paw. How did come up with the "gentle-men" an the "Two-Black Cats"
Hi there! Thank you so much for your comment. The two black cats were among the last things I came up with in Varjak Paw. Originally the Gentleman was very different too; he even had dialogue that the cats could understand! But I thought it would be better to have him on another level to the cats, impossibly huge and distant, and to give him the two black cats, who could be on Varjak's level. I hope you like them! Oh my gosh, thank you so much for replying! I asked the question because I am going to get a custom stuffed animal of Sally, and I wanted to make sure what side the eye was on. Sooooo, just to be clear, the black dot on the left side, is that the eye or the socket? I have honestly took hours looking at all of the pictures of her in the books, debating which side it's on. Again, thank you so, so much for replying, it's great to actually talk a little bit to my favorite author. Will you write another varjak book? Oh wow, that sounds amazing! I would say the left is the eye, and the right is the socket. Good luck with it - and thank you again for the messages, it's great to talk to readers! Hi there, and thank you for your question. I am definitely planning to write another Varjak book one day. You can read a bit about my idea for it in this blog post. Thank you, oh my gosh!! ^_^ I'll totally send you a picture of it when it arrives. Thank you so much for these links! It's great to see your work. And please do send me a picture when it arrives - if you tweet it to @whatSFSaid, I'll retweet it! I love your books. You are one of the best writers in the world. It would be good, because I heard that you're writing the 3rd book about Varjak Paw, if you'd mention and include Varjak's family in it. Also, as I read that in this book Varjak is old, after this it'd be great if you write stories about his children. It *is* available now! Thank you. Hooray! That's fantastic news – thanks for letting me know! And sorry it took so long. Hope you enjoy it! Thank you so much for your wonderful message - that really means a lot to me. I haven't started writing the third Varjak book yet, but I definitely will one day. There's a little bit about my idea for it in this blog post. In the meantime, have you had a chance to read my new book Phoenix yet? We listened to it and loved it. Such a great story, and so well written. Thank you. Now if only Varjak Paw were available on Audible here. We want to recommend it to our friends. I really love your Varjak paw books! I would like to know how Holly got her ice blue eye and what happened to varjak paw's family. Will you be writing a new book to carry on the story? Also, please can you visit my school Burton Green Primary school in Kenilworth if I check with my head teacher? If you come please could you encourage my classmates to read the Varjak Paw books? I have tried but they think the front cover looks a bit weird! I think it's actually quite cool. I'm going to read Phoenix next. Have you written any other books? Thank you so much for your lovely comment! It really means a lot that you took the time to let me know that you loved the Varjak Paw books – that's so wonderful to hear! I am definitely planning to write a third Varjak Paw book one day, and I think it will answer your questions about the story. I wrote a little bit about my idea for it in this blog post. I hope you enjoy Phoenix too! It might seem very different on the surface, as it's about humans and aliens rather than cats and dogs, but it doesn't seem that different to me, deep down. I think if you liked Holly, you will also like Bixa Quicksilver, the alien girl with needles in her hair... Please let me know what you think when you've had a chance to read it! So far, I've only written those three books, but I'm working on a new trilogy at the moment. The working title for these books is TYGER and I wrote a little bit about it in this blog post. And I would love to visit your school - if they would like to invite me, please could you ask your teacher to leave me a message with their email address on my author visits page, and then I can discuss the details with them? Hi this is Olivia Dennis in year five.I go to Whaplode church of England primary school. we just read your outlaw varjak paw yesterday.Today our teacher, called Mrs Adie,really misssed reading Varjak paw.Maybe one day you could come to our school and read a book of yours to us.Thank you very much for making varjak paw, our class loves it!!!!!!!!!! Thank you so much for your fantastic comment – it's so brilliant to hear that you enjoyed my books, and that your teacher and your class enjoyed them too! I'd love to visit your school one day. If they would like to invite me, please could you ask Mrs Adie or another of your teachers to leave me a message on my Author Visits page, and to leave me an email address to reply to, so we can discuss the details? Thanks again - and please give my best wishes to everyone at Whaplode! Thank you so much for your brilliant message - I'm so glad you're enjoying my books! Hi this is Izzie from whaplode church of England primary school , your books are incredible and our teacher Mrs Adie has missed reading your books . We are so excited to be meeting you, our teacher has set up an email and is sorting out you coming !!! Will you make a 3rd Varjak paw ? Thank you so much for your message! I've been emailing with Mrs Adie, and I hope it'll be possible for me to come and visit you one day. In the meantime, yes, there will be a third Varjak Paw book, but it won't be for a while yet - I wrote about it in this blog post. Thank you very much for your message. Being an author is hard work, but if you like reading and writing stories, it is the best work you could possibly do! I wrote a little bit about how I write my books in this blog post - I hope it's helpful for your own writing. Hi SF Said! 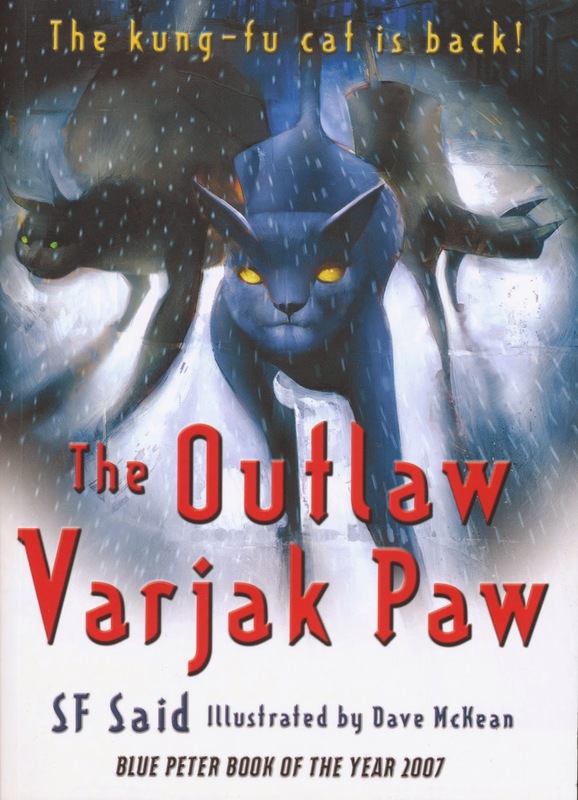 Varjak paw and the Outlaw Varjak Paw are some of my favorite cat books right next to Warriors! I know many people have asked you about a 3rd Varjak Paw but I have an idea. It would kind of be cool if you did a Varjak Paw adventure series. If not, thats fine it was just an idea! Also, if you won't, I can write one myself and then send it to you! Hello SF Said!I think your books are AWSOME!Will a third book of Varjak Paw come out?If it will I will feel Epic!Bassicly the only thing i can say isYOU ARE THE BEST!!!!!!!!!!!!!!! Thank you so much for your AWESOME message - that really means a lot to me! I am definitely planning to write a third Varjak Paw book one day. Here's a link to a piece where I wrote about my idea for it. This book was amazing -- Razor is an absolute fave. Thank you so much, Peri! I'm really glad you like Razor, because I think he has the most interesting story of any of the characters in this book; he changes the most from the beginning of the story to the end. So it means a lot that he's your fave! Hey SF Said. I have read your other book called Phoenix after my friend begged me on her knees to read it (she is the one that commented about sally slicer and hollies kittens). I must say the book was really interesting especially Phoenix as I loved the character Bixa. Thank you so much for your fantastic message - and please thank your friend for begging you to read Phoenix, that really means a lot to me! I'm really glad you liked Bixa, as she's probably my favourite character in Phoenix too. And thank you for your great story idea! I'm not currently planning to write another Phoenix book, but if that's a story you would like to read, I think you should write it yourself! I would be totally honoured if you wanted to write another story about those characters. And just in case it's helpful, here's a link to a blog where I gave some writing tips - and my first tip is to write the story you most want to read yourself! I read the book Varjak Paw and the Outlaw Varjak Paw and let me tell you they were the best books I had read in my almost 10 year long life. On 22 January 2017 the night I finished the book I couldn't stop thinking of even writing my own Varjak Paw related book. If you do decide to write a new book I would love for you to tell me just don't tell me when until its almost published because I will end up counting down every day until it comes out. If you do decide to write the next book to the Barjak Paw series it would be nice if Holly tells everyone what had happened after their last encounter with Holly before she sacrificed herself to help Barjak escape, and have her describe how she sees now. Also I feel as if Ginger and his gang should be in the book more. My name is Ayeh and i would like to tell you how amazing you are in writing varjak paw!Me and my class had fineshed both parts of the book!i love your books you are the most amazing author! May i ask about what happend to Varjaks family?where did he go?iwould really like to know!This has been a great oppurtunity talking to someone special like you!Thank you. Thank you so much for your lovely message! I'm really glad you enjoyed Varjak Paw. You find out what happens to his family at the end of the first book, and you find out what happens to Varjak afterwards in the next book – The Outlaw Varjak Paw. I hope you enjoy reading that one too! second part being where Varjak is a "teen", like Naruto as well..
Hi Brandon! Thank you so much for coming back, and for your great comment. I have to be honest, I've never read Naruto - would you recommend it? Thank you for patience, and keep the Way alive! Tyvm for getting back to me. Yes, I would totally recommend you watch or read Naruto. I'm a huge fan of it myself, and recently, what I believe to be the "final" part of the anime is coming out. I've grown up since I first wrote to you SF, and I'm still thinking about the books Varjak Paw and The Outlaw Varjak Paw everyday. Sometimes I like to imagine what Varjak would be doing right now, or crossing it over with things like Steven Universe/Naruto. Sorry for the late reply, my internet was working quite slowly when you got back to me. Thanks for the recommendation - I'll look out for Naruto! And thanks for your kind words about Varjak - it's brilliant to hear that you still think about the books. That really means a lot. No, I have been unable to get the chance to read Phoenix. My family is quite poor as it is, and I relied on my previous schools to be able to read Varjak Paw and The Outlaw Varjak Paw. I'm hoping that I will be able to, even if it takes a long time. I don't live in the US, either. I'm in Nova Scotia, Canada. Is it available anywhere nearby? Phoenix should be available in Canada too - the US publishers, Candlewick, have all the North American rights. So you could ask your local bookshop to order it, or your local library might already have it; if not, they should be able to get it in for you at no charge if you request it. Here's a link to the Candlewick page for Phoenix with more info. Thank you so much for your message, and your kind words about my work - and please thank your son for me, and tell him to keep the Way alive! Hi Sf Said. Varjak paw 1 an 2 were both amazing! I could not stop reading! Can you PLEASE make a third book. If you do i bet it will be amazing just like the others. Thank you so much for your amazing comment - that really means a lot to me! I am definitely planning to write a third book about Varjak one day. I wrote a bit about my idea for in this article, which you can read by clicking this link. Thanks again - and keep the Way alive! Hi sf said i just wanted to say thank you. I'm already reading the outlaw Varjak paw. Thank you so much for your message! It was an absolute pleasure to visit Perrymount, and to sign your book. I really enjoyed meeting everyone. I hope you enjoy reading The Outlaw Varjak Paw! My teacher has just finished reading the outlaw varjak paw to us TODAY!!!!! You might have experienced some comments from people in my school, but you might not know that. Your books are like generations, passing on; Because ever since my teacher has read both of your books, he has read them to every class he has taught! I am very exited for when you write/publish the third varjak paw! Until then, I am trying to persuade my parents to buy me pheonix! Love-Login(pronounced Lo-j-ain)Soliman year 5 rowling alyasmina school. Thank you so much for your wonderful comment, and please thank your teacher for me too! It means a lot to hear things like that about my books. I don't find writing easy - Varjak Paw took me 5 years, and Phoenix took 7 - but all the hard work feels worthwhile when I hear from readers like yourself. I hope you enjoy Phoenix too - please let me know what you think if you have a chance to read it! Thank you so much for your amazing comment - it's an amazing thing for a writer to hear something like that! Thank you so much for your lovely comment, and your fantastic drawings - of course I remember you! I really enjoyed visiting Emmaus today and meeting brilliant readers like yourself. Keep reading, keep writing, keep drawing - and keep the Way alive! I love your Varjak Paw books but i have an idea for another! What if the rest of the Bones gang come after Varjak and the rest of the Free Cats. It could be Varjak's last fight. Thank you so much for your message! I am planning to write a third book about Varjak one day – I wrote a bit about my idea for it here. And if you'd like me to visit your school, can you ask a teacher to get in touch with me? If they can leave a comment on my author visits page with an email address for me to reply to, then we can discuss it. This is the book I am reading! I recommend this book to people who love animal adventures and want to see what it's like to be a cat! Thank you so much for your message, and for recommending The Outlaw Varjak Paw - that means a lot to me! How do you find ideas like varjak paw? It's a very good book.